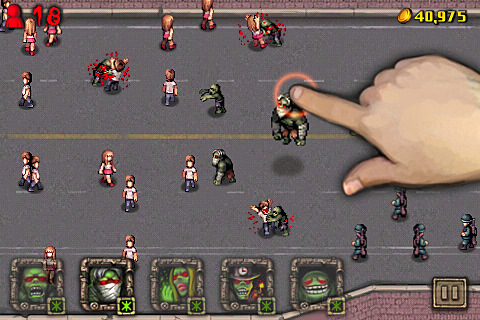 Angry Zombies is a real-time strategy style game developed by HighMind where you control hordes of zombies and your goal is to wipe out all the humans in each level. There are over twenty levels, and I have spent hours of gameplay time trying to figure out better strategies to overcome each level. The objective of the game is simple. Kill all humans to move on to the next level. There is a different amount of enemies you are required to kill for each level in order to complete the stage. As you progress through the game, newer enemies with special abilities will be introduced. You will also be able to purchase new zombie units using the currency you gain on completing each mission. The game allows you to create two files, so you can try it on normal and hard mode or even have a friend play as well. The controls are simple, tap to select your unit, and tap to summon them. It may sound easy to play but it still takes a little use of your noggin, so spamming a single unit may not work as well as it does in movies. Angry Zombies doesn’t run on a life system so there is no game over. Because of this you can retry as much as you want which makes it quick to think of new strategies. There are no visible bugs except for the fact that you are limited to a certain amount of zombies allowed, which is not specified. 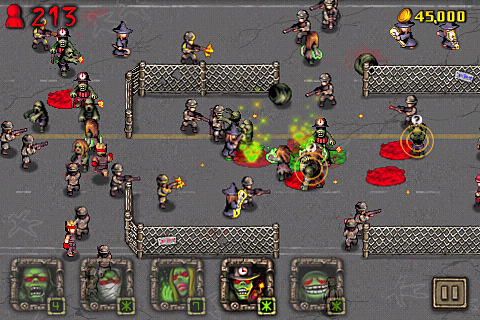 Angry Zombies runs pretty smooth judging by how many units you can have on-screen at the same time. The music wasn’t all that hard to listen to compared to other games, but if you wanted, you could adjust the sound effects and background music to be on or off. The only problem I had with the game is where they chose to place the zombie icons. At times I would accidently tap to select a zombie when I was tapping to summon a zombie. Besides that minor flaw, there was really nothing else I have to complain about. My overall experience with Angry Zombies has been very satisfactory. I would definitely recommend this game to all my friends who own an iPhone or iPod touch and people who are looking for a simple game with great replay value. And if you are still a little hesitant about spending the $1.99 for this app, there is a free version floating around in the app store that won’t let you down either. Sample the free version of Angry Zombies on your iPhone. AppSafari review of Angry Zombies !! was written by Vincent Tam on February 5th, 2011 and categorized under Action, App Store, Games, Resource Management, Strategy. Page viewed 5156 times, 1 so far today. Need help on using these apps? Please read the Help Page.